The Holden versus Ford debate has been around for as long as the cars themselves. But with the curtain finally falling on local car-making in Australia, the chance to take a sideways look at six decades' worth of competing product from Holden and Ford was just too good an opportunity for motoring journalist Dave Morley to pass up. This book isn't a workshop manual, and it's definitely not a reference source. But it is a tongue-in-cheek look back on the cars we drove, and a fond examination of what was so good and evil about them. Along the way, you'll discover stories you haven't heard before, lies debunked and legends cut down to size. Not to mention some genuine what-were-they-thinking moments. 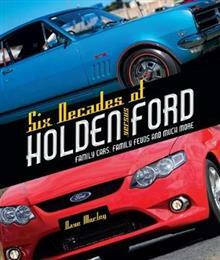 Highly pictorial, organised into chapters by decade and with a series of 'road tests' that pit the Holden and Ford model released at the same time against each other, this book explains why each Ford and Holden family car was the way it was. Had he been born just a bit smarter, Dave Morley would have been an engineer or industrial designer. In the absence of Mensa a-knocking, he instead became a motoring journalist and has road tested every Holden and Ford (and pretty much anything else on the road) built in Australia since 1986. His passion for the subject matter has also seen him track down the Falcons and Kingswoods he was too young to drive professionally, and give them a walloping as well. Dave has owned a variety of both Ford and Holden cars over the years and remains a front-bar leper by refusing to nominate one brand over the other, believing them both to be capable of stupidity, short-sightedness, ignorance and world's-worst-practice. But when they get it right, both Holden and Ford have produced some truly inspiring cars. And Dave has the speeding tickets to prove it.